My Etsy Black Friday hauls! As I received the last of my Black Friday treats from Etsy this weekend I knew I had to share. I’m on a big savings drive at the moment but I still wanted to grab a few bits. I set myself a budget and then started loading up my Etsy cart. I blew my limit about three times over. Oops. I wanted to support some UK shops this Black Friday, so these are all run by UK peeps. Having already placed a big order from this shop before, I just decided to pick up a few sheets of things I needed. Yes I needed beer stickers. As always, these shipped super fast and are cut to perfection. The Mini Sampler was an extra and oh my what a generous freebie! Each sheet is just £2 which for the amount you get is really good value. The stickers are printed on ordinary sticker paper, but the colours are still bright and strong. This is my first order from this store and arrived at the weekend, though the store has a shorter turnaround time in non-sale periods. This sticker paper is vinyl and has a really nice feel to it. I bought one full kit and an extra sheet from another kit. This is the kit and just look at those lovely soft pastels! It’s just £10 for this kit in matte which is really reasonable for the number of stickers you actually get. I’ll get several weeks worth of planning out of these! Just look at these cute designs! I must admit, the kit was basically bought for the bunnies and the sloths. The top sheet is from the kit I wanted but as i’m only moving into a vertical from Jan I’d have to wait for next Winter to use a full kit! Instead I bought a single sheet of boxes that I could use in my personal planner before Christmas. The second sheet is another bumper sampler – how cute are those foxes?! I’d been debating getting some inserts from Ali for a while and when a coupon code popped up on Black Friday, I finally hit that order button! I picked up some simple cream dotted and grid inserts and everything else was freebies! It was such a lovely package to receive, bundled up beautifully! The paper is a lovely quality and everything is cut and punched perfectly. The next time I need inserts or a Midori booklet – I’ll be going back! Finally, and another new shop for me. 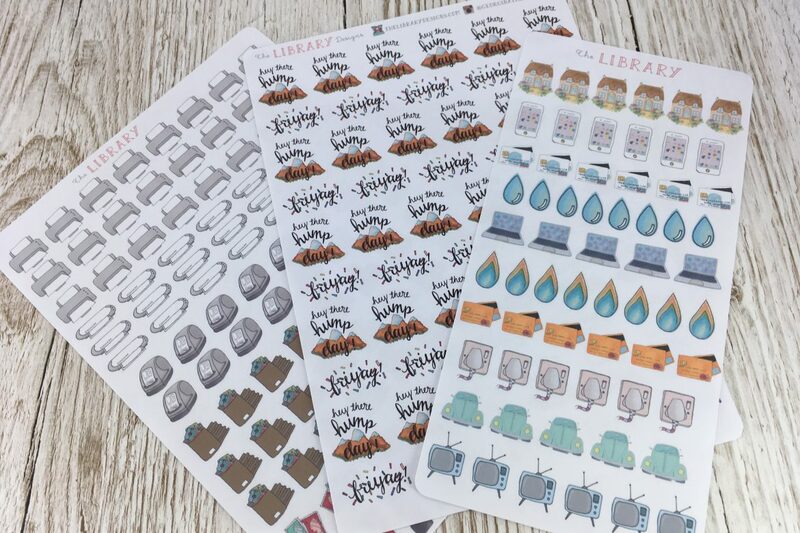 The Library Designs has some beautiful hand drawn stickers and their packaging is probably the best I’ve ever come across. From the stickers on the envelope to the attention to detail – the sampler looking like an actual library ticket I was seriously impressed. The bill stickers on the right hand side are easily my favourite and such a nice idea. The sticker paper is traditional paper and the quality is fantastic. Each sheet varies in price but they’re all fantastic value. Between the artwork, quality and how everything is presented I’ll definitely be ordering again! What did you buy this Black Friday? Anything for yourself, or just Christmas presents? Let me know in the comments below! Please note, this post may contain affiliate links. They don’t cost you anything to follow, but help me keep this blog running. Thanks!